God is still calling men to change the world, to change their families, their places of work, their neighborhoods and their parishes. It is our prayer that we can help men to recognize and act upon this truth. In so doing it is imperative that men not only be called back to the Church, but also that the Church, be called back to men, doing all that it can to understand how to reach and mobilize men for Christ. The Men's Breakfast Club meets periodical. Our Saturday morning meetings begin at 7.30 am with a hearty breakfast, followed by a featured speaker who serves to enlighten and inspire our group to spirited discussion, in small groups. Our program concludes promptly at 9 am. 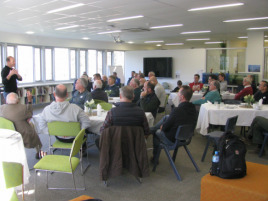 Next Men's Breakfast is on Saturday the 15th June at St Catherine's School at 7.30a.m.